It is a sad day for me. I have picked many “fights” with friends to defend my hero, Roger Federer. To insist that he still has few years of outstanding tennis left in him, and that he will win a few Grand Slams before he finally hangs up his boots. So having done all that, it is indeed a sad day for me today. When I have to admit that Federer’s best days are behind him, and that there are far too many players today – not just Nadal – who are having a shot at him, and are also succeeding in beating him. When it was only Nadal, there was stil hope. That in some final, Nadal may be a bit off color, and Federer may be in top form, and Federer would still win. Or that Nadal could be injured, and then Federer would have smooth sailing. But now its no more just Nadal. Djokovic of course, but many others too, have been challenging Federer. And he has not been able to hold his own many a times. So unless things change dramatically, I personally will not claim that he has it in him, now, to win more Grand Slams. Or in fact, to win anything of significance. In fact, I would rather that he retires now, because for die-hard fans like myself, it pains to see him lose against small timers. He is far far bigger to lose like that. He is an icon, a legend.. I don’t want to see him lose badly, to newbies. 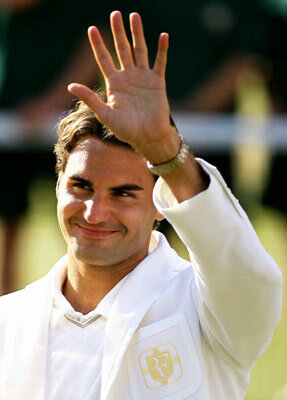 For me, Federer will continue to be the best player who ever walked on to the tennis court. With due respect to Samparas (he comes closest to Federer in my book), Federer has moved beyond and ahead. Not just in terms of Slams, but in terms of the range of shots, the consistency, the class. And no, for all those who talk about Borg or McEnroe or Connors or Lendl or Becker, or Agassi, seriously, they were not close to Samparas or Federer. As for Nadal, I can see the struggle now. Fitness wise. And which is what has to be admired about Federer. That he remained reasonably injury free to dominate the game thus, and for so long! I want to remember Federer as no. 1. Please hang your boots, and enjoy the twins, Federer..